Further to the company’s innovative and reliable equipment for mining, bulk material handling and minerals processing, TAKRAF is increasingly distinguishing itself as a complete service provider across the entire value chain. At BAUMA 2019 (April 8- 14 in Munich, Germany), visitors will, for the first time, be able to have a complete overview of the company’s entire service portfolio, which ranges from project development services to technical studies on comminution and minerals processing, innovative fabrication solutions, various technical services and comprehensive after-sales support. 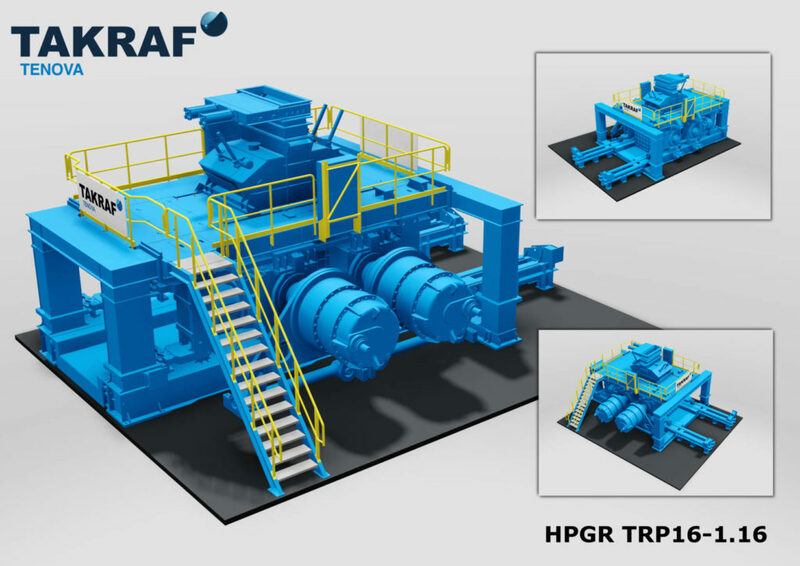 With a view to further developing their capabilities within the market of the comminution industry, TAKRAF continues to develop their range of roller presses, with a scale model of a High-Pressure Grinding Roll (HPGR) on display at the booth. Two of these machines are currently being manufactured at the company’s specialized fabrication facility in Lauchhammer, Germany. These machines can each handle more than 1,000 tons of cement clinker per hour, with each machine incorporating rolls with a diameter of 1,800 mm and a weight of more than 50 tons per roller. In order to meet the challenging longevity requirements of such a machine, each roll surface is protected from wear by weld hardfacing for cement applications, and with tungsten carbide inserts for ore processing. With the integration of the well-known DELKOR and Tenova Advanced Technologies (formerly Bateman Advanced Technologies) brand of products into TAKRAF as specialized product lines, the company’s portfolio for the minerals processing and beneficiation sectors has been considerably enhanced. At BAUMA, visitors will be able to focus upon the company’s capabilities in minerals processing, including Solvent Extraction (SX) and lithium recovery; as well as flotation, thickening, filtration and Dry Stack Tailings (DST). No matter what your needs are, TAKRAF is your innovative specialist for mining equipment, minerals processing, technical studies and after sales support for your customized solution – no matter how big or how small! Stay tuned, and visit us at BAUMA 2019, hall C2, stand 349 at Messe München in Munich, Germany.